Most of us face a never ending avalanche of emails. By applying rules, you can leave the filtering and sorting of your email to your Mac or mail server. So, you can focus on the emails that really matter. For example you can color email based on the sender or topic. Or you can move all email from @yourwork.com to a folder. You can play a sound when an important email arrives. Or send an automated reply when you receive an email from a specific sender. These rules only work when your Mac is turned on and connected to the internet. Assuming you have an IMAP or MS Exchange email service (iCloud, Gmail, most work eMail) the rules will propagate to all other devices once the main computer has applied them. A better solution is to set the rules at the mail server using the webmail interface. Then the changes will happen right at the beginning. Below are some examples about how to set rules or filters on the most common mail servers. It all comes down to logging into the webmail and changing the settings. *Not all Yahoo email accounts in Apple Mail app are IMAP compliant so messages moved to a folder are not visible. If you really want to get more sanity to your stream of private and / or business email you might want to try Sanebox. This cloud based service will sort all your email. You can even set it to delay the delivery of certain emails to a specific day or time during the week. The goal is an empty inbox. Tackle that long list of unread mail and bring some piece of mind to your mail. I hope this blog was helpful for you, please let me know if you need help getting your email back under control. 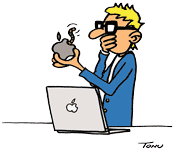 Posted on June 24, 2014 by Rogier Willems and tagged Mac Apple email Rules Management.